WHAT A JOKE — RECORD OF PROPERTY BOUGHT IN 2006 WAS LOST DURING 1999 MARTIAL LAW! As the Supreme Court resumed hearing the Panamagate case on Wednesday, Advocate Salman Akram Raja picked up his arguments where he had left them off. “I will only argue this case based on the evidence present,” Raja, who represents Hassan and Hussain Nawaz, continued. The matter can be sent to relevant departments for inquiry as the Arsalan Iftikhar case determined that trials for cases can be held at corresponding forums, Salman Akram Raja told the court. “A court has never conducted an independent inquiry in any criminal case,” Raja argued, adding that Article 10 of the Constitution says that every citizen of this country deserves a fair trial and that departments formed under the law should be allowed to do their job. “There is no charge against the Prime Minister, so there is no charge against his children either,” he continued. “If we suppose that the PM’s children are his employees, according to the National Accountability Bureau’s laws, then the burden of proof does not fall on the defendants,” Raja argued in court. “This is not a criminal court, so even if Hassan and Hussain Nawaz are suspected, there is no proof against them,” he added. There were eight questions that the court posed to the defendants, including the relationship between Mian Mohammad Sharif and the Al Sani family, the shares in Nielsen and Nescoll, and the profits the family gained from them, the counsel recalled. Lawyer Salman Akbar said that Sharif family has ties with more than one Qatari royal family but he cannot disclose the name of other royal families before the court due to certain reasons. “There were questions about the trust deed as well, and in this hearing, I will answer all these questions,” he told the court. Justice Khosa advised Raja that he should first finish his arguments before answering the court’s questions. 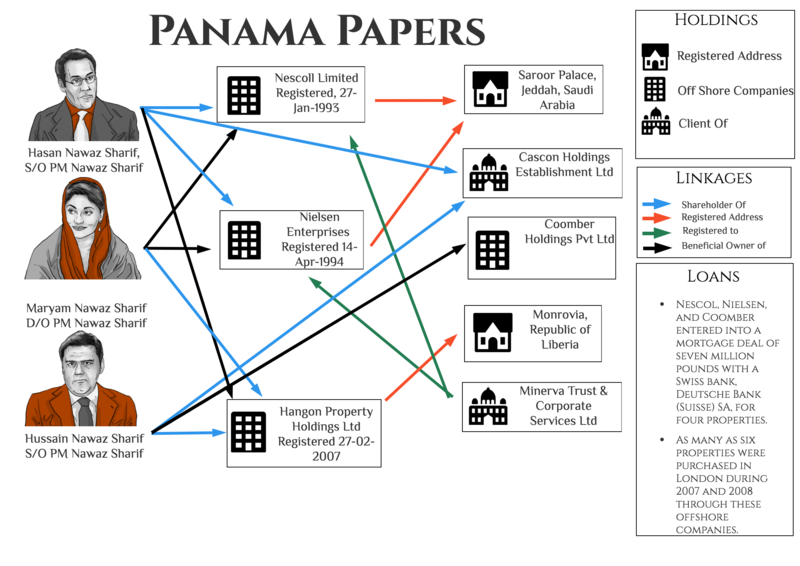 Moving on to the matter of the London flats, Hussain Nawaz’s counsel argued that the flats were bought by the Al Thani family between 1993 and 1996. “The Sharif family did not own the flats in 1999, as Hussain Nawaz was given the bearer certificate to the flats by the Al Thani family,” Raja argued. He added that the shares for the flats were given to Minerva Financial Services in 2006. The allegation is that Maryam Nawaz contacted Minerva Holdings, Raja retorted, upon this, the bench asked that evidence should be proved that Hussain Nawaz is the beneficial owner of the offshore companies. The Pakistan Tehreek-i-Insaaf (PTI) had announced on Tuesday that it would submit three more documents to disprove the stance adopted by Prime Minister Nawaz Sharif and his family, but the ruling Pakistan Muslim League-Nawaz (PML-N) is not convinced. “We are submitting three more documents — one from PTI chairman Imran Khan that authenticates all previous documents presented by the party, the expert opinion of UK-based lawyers and a document that proves that Maryam Nawaz is the owner of UK-based firms Minerva, Nielson and Nescoll,” PTI spokesman Fawad Chaudhry told a press conference. He said that Imran Khan would submit an affidavit stating that all documents previously submitted by the party were credible and authentic. They tortured Rehman Malik by placing his hands and feet on ice for up to an hour at a time at a ‘safe house’ in Islamabad. Three years on, he still has trouble feeling sensations in his palms and soles from the punishment, meted out in black masks, by Nawaz Sharif’s heavies.His neck, too, bears the painful crick from a year spent in solitary confinement in a tiny cell at Rawalpindi’s Adila jail with a brick wrapped in newspapers for a pillow. Malik, in mortal fear of convicted terrorists and official hatchet men, found his monthly half-hour visit from his seven-year-old son his single comfort. Three times following his arrest in November 1996 the courts ordered Malik’s release. Each time he was re-arrested on trumped up charges until, after 12 months of humiliation, the Pakistani Supreme Court itself ruled his detention illegal. Malik’s crime? To have been the deputy head of the Federal Investigation Agency (FIA), Pakistan’s equivalent of the FBI, investigating allegations of massive corruption by Prime Minister Nawaz Sharif, his family, and cronies. He is also promising further explosive revelations, which will implicate Sharif and senior Muslim League politicians in allegedly creaming off more of the country’s wealth overseas. Malik’s report last year was painful enough for the deposed Prime Minister, as were the cat-and-mouse tactics by which Malik has been a thorn in his side since. The 200-page report, smuggled into the country on Sharif’s official Jumbo jet, set out a secret web of fake bank accounts and firms in offshore tax havens through which Sharif’s family allegedly siphoned off more than $70 million (£40m) into London property, Swiss investments and banks in New York. The family, whose empire grew hugely while Sharif was in office, was also accused of defaulting on $120m of state bank loans, a favourite way of milking the public purse. According to further documents seen by The Observer, however, the revelations appear to be the tip of an iceberg. Following inquiries over the past year, Malik says he has established further channels by which the Sharif family channelled money illegally offshore. They include $2.74m allegedly deposited in the account of an Essex-based Pakistani family at the Atlas BOT (Bank of Tokyo) Investment Bank in Lahore as security for loans to four Sharif family members. They also include $4.6m deposited at the Al Faysal Investment Bank in Islamabad as security for a loan to Hamza Board Mills, a paper, and forestry firm in the Sharif family’s Ittefaq group. Among all his amassed wealth, Sharif also appears to have concealed ownership of a Russian-made Ulan helicopter, which he used during election campaigns. The aircraft, worth more than $1m, was bought from an Arab prince, Sheikh Abdul Rehman Bin Nasir Al Thani of Qatar, in November 1996 and registered in Sharif’s name at the Pakistani Civil Aviation Authority, according to official documents obtained by Malik. It was, however, not declared on Sharif’s statutory filing of assets and liabilities to the country’s Election Commission. ‘This was a man who once told me he could not afford a second-hand Mercedes. How then could he buy a helicopter?’ Malik asks. Most explosive of all, however, is likely to be Malik’s new investigation, which is almost concluded and alleges laundering of more than $100m offshore via a network of UK trusts, Swiss accounts and offshore havens including Liechtenstein.  In an emergency budget after Pakistan’s nuclear tests last year, import duties on luxury cars were cut from 325 per cent to 125 per cent. A week later they were restored. In between a friend of Sharif imported 80 cars.  In 1996 senior figures at Bankers Equity Limited, a finance house granted a huge loan, believed to be more than £10m, to close associates of Sharif. Last summer the bank collapsed and several senior managers, including a friend of Sharif’s, were arrested. The loan is outstanding.  After the 1997 elections the Sharif family and their business concerns were able to reschedule and renegotiate loans worth nearly £100m from eight banks. When ordered by courts to pay some back they surrendered 33 factories. Only one factory was fully operational, the rest closed, out of order, or both. Sharif, his family, and former Ministers have consistently dismissed the allegations as politically inspired. Sharif himself is still in ‘preventative custody’, as the army calls it, in a government guesthouse on the outskirts of Islamabad. General Pervez Musharraf, the self-appointed Chief Executive of Pakistan, has not revealed his plans for the man ousted in a coup 10 days ago. Military sources say the evidence is being gathered to put Sharif on trial for corruption and possibly treason. Sharif’s former residence, the 100-acre Raiwind estate, near the city of Lahore in eastern Pakistan, is widely seen as a symbol of the opulent lifestyle the Sharifs have led since their pursuit of power and wealth began to pay off 15 years ago. Last week The Observer was the first Western newspaper to visit it since Sharif’s fall. Brand new roads lead out of Lahore, where the Sharifs have two other houses, to the walled 100-acre estate. A turning leads to a helicopter pad and a set of steel gates. Beyond is an open, grassy compound where five houses, all in white-washed villa style, lie in a rough circle around a man-made pond. Each has a huge colonnaded porch sheltering a £20,000 four-wheel drive Jeep. Two of the buildings are partially constructed as is a pool, though a lake stocked with fish is completed. There is a small zoo. All the houses are similar, with deep red carpets and velvet curtains throughout. Sharif’s own house is distinguished by the number of televisions – the Prime Minister was gadget crazy. Now army machine gunners have replaced the bodyguards who previously watched the compound’s perimeter. And the muzzles of their weapons point in as much as out. Raiwind is, to the ousted Prime Minister’s critics at least, a symbol of how his administration manipulated government to benefit itself. According to opposition spokesmen, Sharif has ‘used public office for personal economic gain’. It is corruption, they say, even if it is within the letter of the law. Soon after coming to power for a second time in February 1997 Sharif declared the Raiwind site to be the ‘Prime Minister’s Camp Office’ – his home away from the capital. The local municipal authority took on the estate’s maintenance at an estimated annual cost of 40 million Pakistani rupees (£500,000) and built a new road for it, while the state has also supplied gas, electricity and a 200-line telephone exchange. Near Raiwind last week feelings were mixed about Sharif’s fall. Many remain loyal to a man they see as a local boy made good. ‘He has done a lot around here,’ said Ahmadullah Ali, a farmer. ‘He is a good man.’ In the rough and tumble world of Pakistani politics, Sharif may be down, but he still isn’t out. This entry was posted on Thursday, February 16th, 2017, 9:48 am and is filed under CORRUPT ROGUE NAWAZ SHARIF, Ishaq Dar Financial Criminal, Kulsoom Nawaz:Pholan Devi of Pakistan, Nawaz & Shahbaz Sharif's Business Scams, Nawaz Sharif :Abbaji Da Nikama Puttur. ", NAWAZ SHARIF FAMILY TURPITUDE, NAWAZ SHARIF LOAN SCAM, Nawaz Sharif Malcontent, Nawaz Sharif Massive Corruption, NAWAZ SHARIF SAGA OF ABSOLUTE & CHRONIC CORRUPTION, NAWAZ SHARIF THIEF, NAWAZ SHARIF US & SAUDI AGENT, NAWAZ SHARIF US CIA ASSET IN PAKISTAN, Nawaz Sharif's Petrol Hoarding Money Making Scam, Nawaz Sharif-The Prime Minister from Hell, NAWAZ SHARIF: THE LOOTER, Pakistan's Debt Bomb, PIA Destruction By Nawaz Sharif, PMLN Choor. You can follow any responses to this entry through RSS 2.0. Both comments and pings are currently closed.